As said before, AirParc is initially a climbing park. The park is composed of 8 courses for every level of difficulty. So you’ll can find a course without harness for 2 years old childrens, course for teenagers and course for adults. In total, there is approximately 70 varied exercises to do. 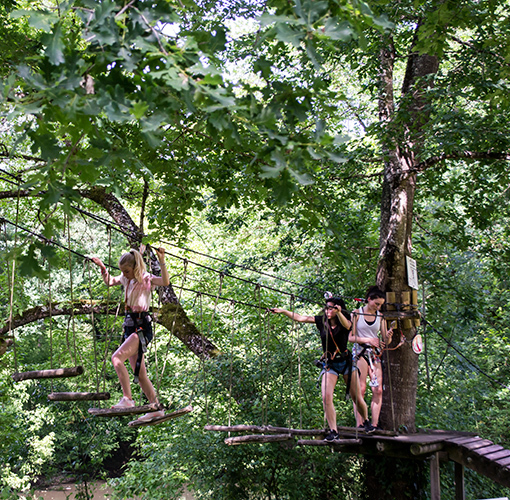 There are bridges, scale, climbing wall … During the activity, you’ll can cross many times the river with lot of zip lines! You like tree climbing ? So you will love to do it by night. A unique experience to enjoy the tree climbing in a different way that you use to know. Let’s put your headlight on and go for 2 hours of fun ! Course fees include single entry. Group rates: 2 € discount from 8 people. 1 € discount on the single entry. April – June / September – October: open on weekends and by reservation during the week.